One of the pleasures in watching an older film for the first time is the opportunity to enjoy watching actors I’ve not seen much of before. That’s certainly the case with ‘Westworld’, which stars Yul Brynner, Richard Benjamin and James Brolin, all of whom I’ve only seen in small doses beforehand. 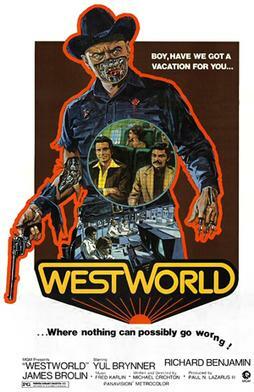 ‘Westworld’ itself is a terrific piece of science fiction from 1973, that builds on a terrific premise to deliver a thoroughly entertaining movie that clocks in at under 90 minutes. How’s that for efficiency? The film is set at a futuristic theme park, where tourists can spend $1,000 dollars a day to live in one of three advanced theme parks, ‘West World’ (set on the American frontier in the 1880’s), ‘Roman World’ (set amidst all the luxury of Rome) and ‘Medieval World’ (set in a castle in Medieval Europe). The parks are populated by advanced robots that look and act like humans, and who are controlled by a vast team of engineers and scientists to help facilitate exciting and engaging experiences for the paying guests. We spend most of the time in ‘West World’ with Peter (Richard Benjamin), a first time guest, and his friend John (James Brolin), who had visited previously, and the first half hour is a terrific example of table setting. Michael Crichton (who wrote ‘Jurassic Park‘) wrote and directed this film and he does an excellent job at portraying the mystery and the wonder of the characters at the outset. He has a keen eye for the way people would behave in this artificial situation as they go through a range of emotions until they become comfortable and start to relax into the role playing environment. Brolin’s John is cool and collected and he provides a lot of useful exposition about how the park works and he reassures Peter about some of the doubts he has, particularly after an early encounter in a bar with a menacing gunslinger (Yul Brynner). Science fiction movies can often fall down when there’s too much explaining to do and the exposition becomes clunky, but Crichton’s script makes this feel natural and the aspects of the film that show the team behind the scenes adds something extra to the experience. There are little hints throughout that suggests things aren’t quite going to plan, with a higher level of machine malfunctions than normal and some robots not reacting to instructions from the control room. The escalating severity of these incidents helps heighten the sense of danger and builds the tension towards a boiling point. Richard Benjamin and James Brolin play their parts well, and their jovial banter helps to sell the excitement of running about and roleplaying in this adult background, but they are both overshadowed by Yul Brynner’s gunslinger, who initially seems to be a glutton for punishment. Brynner is perfect for playing a robot, cold and menacing, and he’s one of the most frightening screen villains I’ve seen in some time. It’s all to do with the way Brynner carries himself, from the cool smirk that appears on his face, to the effortless way he rides a horse one handed across the desert outside the town. In hindsight it’s interesting to note the influence ‘Westworld’ would likely have had on the science fiction of the 80’s and 90’s, with ‘The Terminator’ in particular sharing similar elements. ‘Westworld’ is a very short film as well, which helps the story to feel compact, to develop well and reach a satisfying conclusion covering its main themes. Interestingly, it’s being made into a TV series by HBO, and whilst remakes of films into TV shows isn’t always the most thrilling example of originality, there is definite scope to do more with the premise and the success of ‘Fargo’, ‘Hannibal’ and ‘Bates Motel’ suggests there may be some merit in this new adaptation. Overall, ‘Westworld’ is an excellent piece of science fiction that takes a superb premise to a thrilling conclusion, and it’s well worth seeking out.